She pulled an item out of her black handbag and lifted a cigarette to her mouth. Immediately my infatuation with this woman died. I'm not sure why so many people in Russia and Eastern Europe smoke, but if you look at any study you will see these countries dominate lists of the highest smokers per capita. It's the one habit that completely turns me off. I can tolerate almost anything else, and accept that everyone has flaws. I'll never forget entering a pub in St. Petersburg, being completely enveloped in a thick haze and foul smell. The scent permeated my heavy winter coat and lingered with me the entire journey. I understand there's now a smoking ban in effect, and for this I'm grateful. If someone wishes to smoke, it's their personal choice. But I support these bans in confined places like restaurants, airports and shopping centers, where the smoke impacts the well-being and enjoyment of others. Such bans have existed in America for almost a decade. In all my travels, I pay close attention to the local women. So many beautiful and diverse bodies and faces in each country, much more interesting than the male form. And, no, I'm not a lesbian. :) So, I thought it would be interesting to start a series of posts dedicated to various snapshots I've taken of these beauties. The inaugural post is dedicated to your beloved Russian women. Spitting, yes. It's a classless and gopnik like behavior, unless the person is choking of course. :) Or, they are chewing tobacco. I'm not even sure if people in Russia do this? It's quite common in rural areas of America. 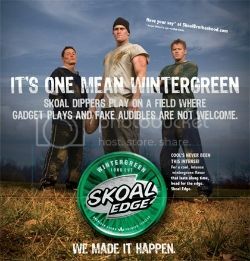 The most popular brand is SKOAL, in the photo below. However, most people who chew tobacco spit in a cup rather than on the ground. "What's the one habit or personal trait that immediately causes the death of your attraction to a man or woman?" - exactly the same, Shannon - smoking. I can stare at a girl and invent some ways to start a talk, to get acquainted, but as soon as I see a cigarette, I do not consider her attractive at all, and turn aside. Of course, what's always most important in the long term is someone's mind. Superficial things can only float and sustain a relationship for a short time. At least, for most people. I don't like overly loud or talkative people either. They make my head hurt! I'm socially awkward and a serious introvert. Not only in Eastern Europe. In Spain, Franca and etc. many people smoke. You're right, but former Soviet bloc countries and Russia have the highest rate of smokers. In my area of America, it's not so common to see smokers on the street, etc. However, my sister has smoked since she was a teenager. She stopped when she was pregnant, but then started again. The problem is that her husband smokes, so it makes it much harder for her to stop. Sorry to disappoint you. :) There's nothing interesting about being sexual with a woman. I tried it in college, and didn't like. I would not be so harsh. You just saw a person you don't know anyway. You know nothing about that person, except that she smokes; and you don't know whether it was exceptional circumstances that made her take a cigarette, or is it a habit.Also, what would attract you in a person, her beauty? Probably not the best kind of criteria. What causes the death of my attraction? Lies and/or cruelty. It's not harsh. I cannot stand cigarette smoke. It doesn't mean that I wouldn't be friends with a person, but I would not be intimately involved with someone who smokes. This is just a personal preference. Physical appearance is almost always the initial attraction in romantic relationships. However, physical attraction can grow over time. All of my past boyfriends started as friends first. Initially, I wasn't attract to them, but once I got to know them, their personality and mind, all of that changed. So, in the end, the most important thing is what comes out of someone's mouth and their actions (kindness, sympathy, open-mindedness). These are the traits that make a relationship last. A woman with a cigarette in her mouth makes me disgusted. Then we think the same, at least on this issue! Drunkenness leads to a lot of bad and obnoxious behavior! I'm always the sober one in my group of friends, trying to keep the others from making bad decisions or a fool of themselves. Very rarely do I drink to the point where I'm totally drunk. The last time this happened was actually in Russia, where the boys gave me too many shots of crappy vodka. US just has longer history of fighting against smoking than Russia. 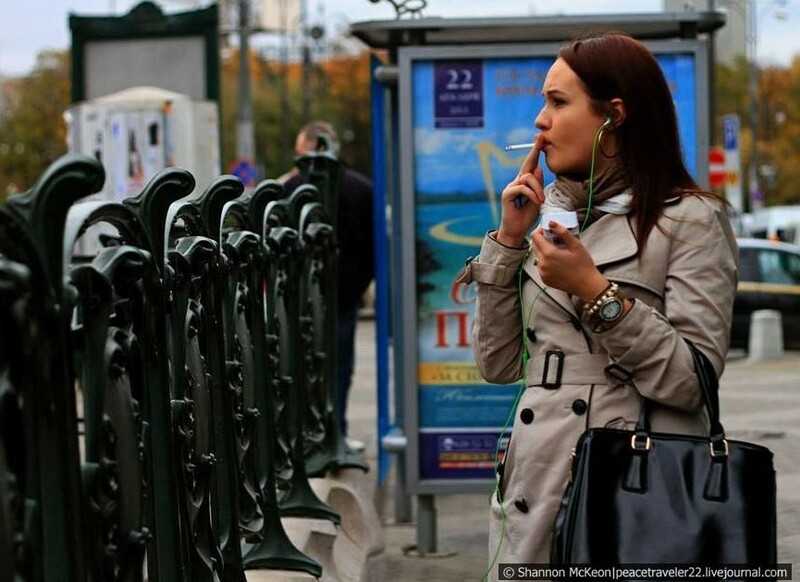 Now the most Russians don't think that smoking is something bad but some time will. I know some cute girl swearing like a bargee (I found this idiom in dictionary. Isn't it too archaic? :)). For me it's worse than smoking. "Swearing like a bargee..." :)) I had to look this phrase up. I didn't even know what it meant. So, you have taught me something new! I think you are right. America has had anti-smoking campaigns for decades, and this has contributed to smoking becoming less acceptable mainstream. However, the big, bad tobacco companies still have a strong and powerful lobbying presence in U.S. politics. For me, like you its smoking. It's vile and smells horrid. The worst is the lingering smell on their bodies and clothing. Any country you encounter that has stress and violence in their lives, they all seem to smoke. In the Middle East, they all smoke. Really heavy smokers. Same in Asia. I have noticed a lot of Russians smoke. But you could say that about any country in Eastern Europe. In western Europe and the US, it's less and less. But now they have electronic ciggies. I don't know how much of an appeal that is. They don't have nicotine. And that's what smokers crave. Some of the e-cigs have traces of nicotine. My law firm represents a huge e-cig manufacturer. But there's also current legislation in the works to tighten regulations on these vapor type units. For a few years, they had no interference from the government. Now the tide is shifting. A few days ago I saw two fantastic film "Alien" and "Alien 2". Movies filmed in America in 1979 and 1986. And I was struck by the fact that all the crew members of the spaceship smoke right in the ship. Including women. Including positive the film's protagonist, a girl. In addition, I have seen many French films of 1960-1970. And there, too, almost all the main characters of the films smoked. I think that even as recently as 20-30 years ago, Smoking was a widespread phenomenon in America and Europe. Even a few decades ago, smoking was still seen as glamorous in America. 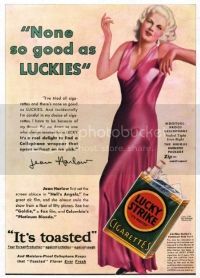 All the cigarette ads featured beautiful women with a cigarette lit in their hand. Classic Hollywood starlets were often photographed with them. Like this ad below. But then things changed, and regulations on advertising became more stringent. Anti-smoking campaigns launched, and the public mentality shifted. I'm not sure if Russia has marketing regulations, but smoking brands can't advertise on American television. Only print ads in magazines. Heh. For me such a habit is probably watching TV and being narrow-minded. Based on my own experience these two things are closely related. Chekhov once said that kissing a smoker is like kissing dirty ash tray... So true... So I quit almost 20 years ago, but it did not change much in my kissing pattern. I do not like heavy perfume and cosmetics, and women who are not dressed per occasion, like high heels for grocery shopping. I would rather like those who dressed more relaxed way for any situation. It feels more friendly. Otherwise I would mention foul language and inconsiderable and ignorant manners. Go ahead, make a post about how ugly I am. But you are probably too lazy to do so. What do you mean...what about man? I find both sexes less attractive if they smoke. Man or woman. Most of all I don’t like to see in people’s faces lie or traces of long unhealthy living. This is turn me off this person forever. I sometimes go to hookah bars with friends. Hookah is very popular in America. However, in my view, hookah isn't the same as cigarettes. First, you don't inhale and second the smell is pleasant and doesn't linger on your clothes. I know smoking is a very difficult habit to break. My sister really struggles with it. So, good luck!